This piece by Igor Stokfiszewski was originally published on PoliticalCritique. This is the first part of Igor Stokfiszewski’s analysis of activities conducted in Ursus – a post-industrial district of Warsaw – by a Polish artist Ja?mina Wójcik in collaboration with Political Critique’s team which are being exercised since year 2011. In this part an author concentrates on reflections inspired by “Factory. Ursus 2014” project. A second part of an article which will be published next week describes experiences of “Let’s Save the Ursus Factory Souvenirs!” social campaign performed in a year 2015 and recent developments of artistic activities in Ursus and their influence on a quality of democracy. This text is a reflection on the relationship between artistic practices and the quality of democracy. It analyses cultural activities conducted by artist Ja?mina Wójcik in collaboration with the Institute of Advanced Study in Warsaw (an independent research and education centre, with culture as an instrument for transforming the socio-political reality and the vehicle of social development among its fields of study). Our activities in Ursus, a district of the capital city of Warsaw, aimed primarily at improving the quality of democratic life and are in line with the trend described by Cristina Flesher Fominaya – an expert in contemporary social movements and transformations in the era of globalisation – as democratic turn”. The turn manifests itself in activities (social, artistic or cultural) enriching communities in three areas: 1) free expression of individuals and groups as a condition necessary for the emergence of a healthy community; 2) the community itself, sensitive to the needs and hopes of individuals, and 3) grass-roots agency, genuine opportunities for affecting reality by the communities. These three categories can be translated into tasks towards improving the quality of democratic life: 1) establishing platforms, frames for individual and collective articulation of needs and expectations, and ensuring they are heard; 2) developing collective processes towards forging individual components into a community that is sensitive to the needs of the individual; and 3) giving prominence to grass-roots agency, initiatives to transform needs and expectations into facts. The latter could be termed ‘beyond participation’ , after Sam Khebizi – French theatre artist, scholar, founder of Les Têtes de l’Art centre in Marseilles, whose main focus is working with the local community. The term refers to intensifying democracy-oriented efforts by expanding beyond the paradigm of participation in the direction of communal decision-making or co-governance. Below, I outline the methodology of activities conducted with the application of cultural instruments for improving the quality of democracy. With several years of working in Ursus community under my belt, I shall attempt in this essay to operationalize the above program and answer the questions: How can artistic and cultural practices be applied for the betterment of democratic life? What content expressed in and through such activities should be poured into the intuitions about the democratic turn of art – art that reinforces this tendency in social and socio-political life? Before we move on to the analysis of the activities that took place in Ursus, I should make an important note. In this account I repeatedly use of the pronoun ‘We’. One of the essentials of positive actions for democracy is democracy in action. Since 2013 Ursus campaigns have been developed and executed by a team consisting of Ja?mina Wójcik – initiator of the project, Izabela Jasiska, Pat Kulka, myself and a dozen of other individuals whom we have repeatedly approached for assistance as well as those who volunteered to work with us. Depending on the need and type of activity, these individuals have been directly involved in or supported the project. Hence, by ‘We’ I mean the group of people who have developed the program of activities and executed them as well as our Ursus-based collaborators who identify with it, more specifically, people who feel a part of the community active in Ursus and working for Ursus. Moreover, in the essay I use large sections of the texts created in the past for various reasons, often administrative or fundraising purposes, as reports or printed information. Although in most cases composed by me, the texts were edited, that is practically co-authored by the team mentioned above. Therefore, this essay in a sense represents our collective work, although obviously, I assume full responsibility for its contents. Factory. Ursus 2014. What is Ursus? Ursus is a district of Warsaw located in the southwestern part of the city. A former industrial zone, it is not however a post-industrial area in the sense of the socio-economic consequences of the fall of the factory formerly occupying the area. It is very conveniently communicated with the centre (16 minutes by a local train, covered by the unified Warsaw public transport payment system) and a relatively dynamically growing area. The history of Ursus reaches back to the nineteen-twenties when the company Posag 7 Panien built a motor works in Czechowice village. 60 years later Ursus was already the home of Europe’s largest tractor factory. The history of Ursus is inextricably linked with the history of Polish industry in the twentieth century. It was there that Poland’s first trucks were built. It was Ursus Factory that supplied vehicles for Polish army before WWII. The local factory of agricultural machinery was the pride of Polish industry after the war and exported its tractors to Europe and the Middle East. The factory also played a crucial role in the birth of democratic opposition in the communist times. Ursus factory strike that began on 25 June 1976 (simultaneously with the protests in Radom and P?ock) was one of the events that gave rise to the founding of KOR – Workers’ Defence Committee, the first open democratic opposition organization in the communist era, one of the foundations of the later trade union movement, and consecutively political movement of Solidarity. Ursus workers, technicians and engineers were approached by the leaders of KOR Henryk Wujec and Jacek Kuro?. In the 1980s Lech Wa? ?sa repeatedly came to Ursus to show his support to the Solidarity trade union active in the factory and to its leaders Zbigniew Janas and Zbigniew Bujak who have since become icons of the struggle to overthrow communist authoritarian rule. As a punishment for the strikes and cooperation with KOR, Ursus was deprived of administrative independence. It ceased to be a town and became a district of Warsaw. This was a turning point in its history. The following decades brought a gradual degradation of the factory (first, due to the failed investment in the Massey-Ferguson licence, then the bankruptcy and liquidation of the factory, following the political and economic transformations in the 1990s). The first years of the twenty-first century saw a gradual termination of manufacturing activity in Ursus and ownership transformations turning the former industrial area into a residential district. Ursus brand was purchased by POL-MOT Warfarma together with the new tractor assembly line and in 2012 transferred to Lublin (currently the brand continues to manufacture tractors also in a factory built in Adama, Ethiopia). On 21 April 2013 Ja?mina Wójcik, artist and teacher at Warsaw Academy of Fine Arts, conducted an Acoustic Walk around the premises of former Ursus Factory. The event consisting of a guided walk around the premises of the factory with the accompaniment of pre-recorded interviews with former factory’s workers (played on portable speakers) was addressed to all people who had collaborated with Wójcik on the recordings and to the artist’s friends. To the surprise of all, the walk attracted hundreds of people – mostly local residents. The area formerly occupied by the factory is not often visited by the inhabitants of the neighbouring residential quarters (due to restricted access to some sections, the factory’s location, away from the main pedestrian routes, partially also due to the neglected condition of the area discouraging potential strollers). The initiative aroused keen interest among the members of the local community who continued to view the former Ursus factory as symbol of the district’s identity. Wójcik had personal motives for executing the walk. The artist’s father was born and raised in Ursus. It is the family archaeology that inspired her to launch activities for the Ursus community. The artist had visited the district in 2011 for a reason that had nothing to do with the factory or her artistic pursuits. She saw the ruins of the former factory, photographed them and showed the photos to her father. He showed great interest in the pictures illustrating decomposition of the industrial tissue since he recalled the place bustling with activity and with thousands of workers. The image of Ursus emerging from the accounts of Wójcik’s father inspired the artist to seek contact with former workers of the Ursus factory and to record their recollections with the aim to preserve the atmosphere of the life of the factory and the district. The got down to work and posted announcements around Ursus, inviting people to contact her about recording their memories. From then on the events snowballed, with the artist contacted by dozens of former employees, trade union activists, local community leaders as well as entrepreneurs currently operating on the area of the former factory. It was then that the concept of the acoustic walk was born. Wójcik spent two years recording interviews with the residents of the district, building relations with the local community and gaining their trust. 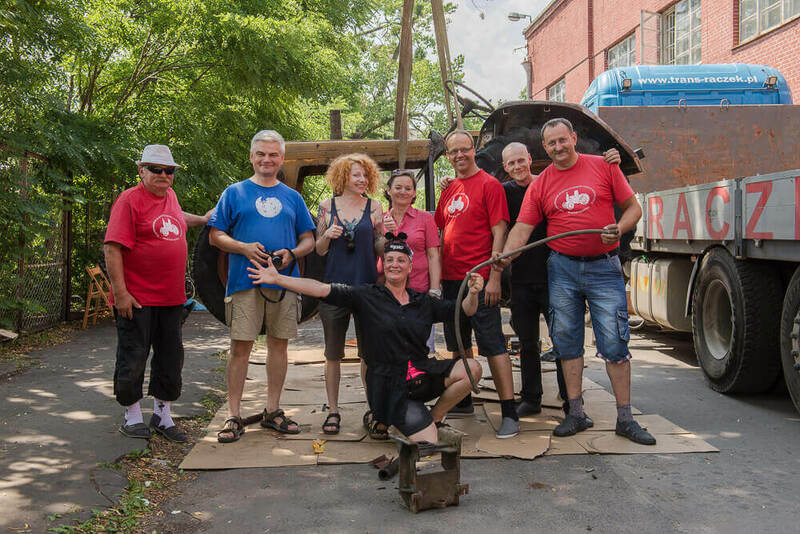 The walk was initially intended as a token of gratitude to former Ursus workers for dedicating their time and sharing their memories with the artist, which was instrumental in preserving the memory of the dissolved factory. The project was executed practically with close to zero costs and was a result of a personal impulse. Its success was a direct result of the artist’s determination, and the empathy-driven growing bond developed between Wójcik and former workers of Ursus Factory. Information about the event travelled through the grapevine among the residents of the district and was announced on posters displayed in public places around Ursus and via the social media, The tremendous interest in the event revealed that the community of Ursus and other participants of the event recognized the authenticity and strength of the undertaking. For this I can vouch myself as one of the strollers who took part in Wójcik’s Acoustic Walk. To me personally, Ursus resonated with a familiarity reflecting my experience. I was brought up in ?ód? – a former centre of textile industry – and Ursus, as any industrial centre undergoing the process of degradation, is a place where I feel at home. However, my motivation to work in Ursus, like in other places plagued by troubles of communal nature, is best expressed through the words of Eugenio Barba – the founder of Third Theatre movement and the initiator of research referred to as theatre anthropology: ‘as though individual needs – ideals, fears, multiple impulses […] – wanted to be transformed into work, according to the attitude, viewed externally as an ethical imperative […] spanning the entire life’. When one finds oneself in a place where social temperature runs high, full of conflicting emotions, and feels that by artistic activities the collective wellbeing can be improved, I simply cannot stop myself from taking action. This was the case in Ursus: the spontaneous response to the recollections of former factory workers that we witnessed during the Acoustic Walk, questions about the current condition of former factory area, also the bitterness of some former workers, were a convincing argument to take a closer look at the situation in the district and to work with its social tissue through the medium of artistic activity. Our exploration revealed that the main problem faced by the local community was its fragmentation that made it difficult to speak with one voice on the issues related the changes under way in Ursus. The inhabitants of Ursus are divided largely along historical lines. One group is composed of the inhabitants of the oldest quarters, Czechowice and Go? ?bki, that existed as villages prior to the industrialization of the area. Another group is that of the residents of Nied?wiadek, a quarter developed in the 1960s to house the workers of the expanding factory. This group contains a sub-group of the workers’ descendants who live in Nied?wiadek but commute to work to the centre of Warsaw. Members of the last group are the inhabitants of a relatively recently developed Skorsze quarter. There is very little interaction among the three groups and the constitutive aspects of their local identities fail to add to the collective identity of the entire district. These diverse identities do not form one larger local community that would be able to communicate and negotiate rules for sharing Ursus as their common home. Moreover, the district has an unusual urban layout. Ursus is split into two parts, with its northern quarters (Nied?wiadek, Go? ?bki, Szamoty and a part of Czechowice, where the grounds of the former factory are located) and southern part (part of Czechowice, Skorosze) separated by a railway. The district also does not have a central area that would fulfil the function of an agora. Instead, each quarter has its own, local centre and the residents of different quarters meet nearly exclusively on the platform of the local train station or in two shopping centres – Factory and Galeria Skorosze. Historically, the entire district was organized around the factory. The factory was the centre of Ursus, its heart, its agora, and all quarters were organized around it. Today, this hart is no longer beating and the place left behind the district’s true centre (occupying roughly a quarter of its total area) is empty and dead. The exploration lead us to conclude that the first activity geared towards the inhabitants of Ursus should be an integrative project and that it should aim at revitalising the area of the former Ursus Factory. This meant reclaiming the area for the inhabitants of Ursus to offer them a platform for integration, and doing it by creating conditions conducive to their expressing their expectations as to the changing identity and the future of Ursus. Following the findings of the exploratory phase described above, we set about choosing artistic practices aimed at affecting genuine social change. We decided to propose the inhabitants of Ursus the following initiatives: 1. Tractor Parade – Ursus tractors crossing the centre of Warsaw to reach the former Ursus Factory. The parade would revive a tradition and serve as a reminder of the history of the local industry. It would also show former Ursus workers that the fruits of their labour continue to work and are cherished by their devotees. The parade was to be accompanied by Ziemia Mazowiecka Brass Orchestra, formerly the band of Ursus Factory; 2. Ursus. A Film Essay – an attempt at visualising the main questions relating to the identity of Ursus with a collage composed of newsreel footage showing the history of Ursus. The task of creating the essay was undertaken by Ja?mina Wójcik; 3. Second Acoustic Walk around the area of the former Ursus Factory with a new element: 4. Spoken Memoirs – equipment for recording and playing back the recorded memories of former Ursus workers and other inhabitants of Ursus; 5. A bird’s-eye group photograph of people holding hands and forming letters ZPC (Zrzeszenie Przemys?u Ci?gnikowego – Tractor Industry Association, former owner of Ursus Factory); 6. Providing space for individual presentations during the local Ursus events. We extended an open invitation for presenters. Responses came from people wanting to share their stories related to Ursus, the tractor industry, give talks (for example, on tractors in literature) or exhibit photographs; 7. Creative summary of all events in the form of Pawe? Althamer’s Draftsmen’s Congress – a three-day campaign of collective painting with the help of the artist and the team of his collaborators. Congress celebrates individual expression, non-verbal dialogue and shared creating. It has performs an integrative function, stimulates imagination and opens non-professional draftsmen to the experience of creation; 8. Neighbourhood Dinner – a closing event, providing the inhabitants of Ursus with the opportunity to voice their expectations towards the future of the district. The postulates would later be delivered to the relevant authorities. To lead participants through the process of self-expression and integration, through dialogue and understanding to consensus – forming of a community – we designed the following steps: two days of working through art, inspiring people to create, encouraging to share their memories and listen to others, nurturing togetherness, building mutual trust, listening to the voices of Ursus inhabitants; on the last day we organized a collective event in the form of a ‘communal meal’, as described by William Robertson Smith, creating a situation in which the inhabitants of Ursus, by that time more integrated and more trusting, would be more ready to speak openly about their needs and expectations towards Ursus. The dynamics of an artistic activity always has a somewhat inward, exclusive direction. The deeper we immerse ourselves in it, the more difficult it becomes to see whether our perspective is consistent with the initial goal and whether the overall direction is right. Hence the importance of opening the creative process to outside intervention, to the reflection offered by those who see the project from a safe distance, activating in creators the mechanisms of introspection. This is why, in the case of Ursus, in December 2013 we held open workshops to increase our competences in working with local communities in post-industrial areas through art. We asked Grzegorz Klaman, a Tricity-based artist with a long track of artistic activity on the area of the former Gda?sk Shipyard, to come to Ursus and conduct workshops focusing on the discussion of the findings from the exploratory fieldwork. Workshop participants were taken on a tour of the former Ursus Factory, familiarized themselves with the conditions for artistic intervention and discussed the activities we were proposing in terms of achievable social results and potential pitfalls involved in artistic practices in post-industrial areas and districts. The key element of the workshop was a commentary offered by Grzegorz Klaman, based on his experiences in Gda?sk Shipyard, where he conducts artistic practices and the activities of Wyspa Institute of Art, an independence cultural centre. The introspection time was very effective and of the number of intuitions and suggestions offered during the workshops one was put to action immediately. Klaman pointed out that we should take into account the voices of all local stakeholders in the area where the intervention is to take place. While prior to the workshop we had planned to focus our efforts on the local community, we faced a task of expanding this group by other stakeholders: representatives of the businesses operating in Ursurs, real estate developer who was about to launch the construction of a new residential quarter and the local authorities. Klaman’s suggestion was all the more valuable that in order to ‘move into’ the former Ursus premises with our social-artistic activities, we needed to secure the approval of the current owner of the area on which we wanted to conduct our project. We approached: Energetyka Ursus power and heat plant that was to host most of the events and that had just gone into bankruptcy and been passed into receivership; Celtic, a real estate developer, the owner of some plots of land covered by the route of the Acoustic Walk; AIG/Lincoln Polska, the owner of the hall we were planning to use to screen the film essay. Simultaneously, we contacted the district administration to secure the honorary patronage of the mayor of Ursus. In the search for potential allies we even went to Otr?busy, to the annual meeting of former directors of Ursus Factory. Negotiations with the owners were a challenging task. The dynamics of ownership transformations in Ursus and various conflicts caused around the former factory meant that we were approached with suspicion at the least. We also needed to be on guard to avoid ‘corruptive’ aspects of the interactions with some stakeholders and to ensure the social aspect of the initiative would not suffer. We wanted to avoid compromises that could weaken or cancel out the social impact of the planned activities – giving voice to the local community. Eventually, we managed to come to an agreement with all stakeholders as to the use of their land. Being viewed as a peripheral activity, art is also a sphere of free experimentation. Its immunity renders it easier to approve as a field of non-obvious, risky and borderline experiments, including ones in the social sphere, seen as building a community on the rules other than the dominant codes in the areas of interaction and social discourse. This attribute of art is worth keeping in mind and exploring. One of the ‘corruptive’ elements that could weaken our resolve in striving for affecting social change in Ursus through artistic activities was being offered funding for the campaign by local business, a real estate developer and other privately-owned and commercial organizations. We did everything in our power to avoid accepting it. We applied for a public grant from the Ministry of Culture and National Heritage (declined to support our campaign) and City of Warsaw Office that provided us with roughly 100 thousand z?otys. All activities were delivered by Political Critique, a legally recognized association, whose primary mission is civil society building. This made it possible for us to avoid commercialisation of the campaign and to maintain relative independence of the state institutions. In order for the activities conducted in Ursus to bring intended results we began making frequent visits in the district, inviting the inhabitants personally to join the social-artistic events we were preparing. We held discussions in local community centres (such as Arsus Culture Centre or Promyk Seniors Club, Mi? and Kolorowa Community Culture Centres) and delivered micro-activities such as art workshops for children during International Children’s Day celebrations in Park Hassów in Nied?wiadek. The workshops were titled Welcome for Tractors in the Factory. Children were asked to create colourful tractors and bring them to welcome the Tractor Parade entering the area of the former Ursus Factory. Scores of children and parents turned up with their colourful tractors. Additionally, on Children’s Day we handed out roughly 700 invitations to cheer the parade, and used this opportunity to exchange remarks with the residents of Ursus, listen to their stories and recollections. We followed the same pattern at other occasions, during Ursus Days held roughly around the same time. Our presence in the district, meeting inhabitants face-to-face and working with them in the kids workshops, were a crucial part of the artistic process, a process that should involve always anchoring in the local community. On 13 – 15 June 2014 Ursus was the scene of Factory. Ursus 2014 campaign. A documentary Ursus znaczy nied?wied? (Ursus Means Bear), with the record of the project’s activities, created by Ja?mina Wójcik, is available online. The simplest conclusion would be to say that we succeeded in executing the planned activities. However, the intensity of the three days spent in Ursus would be difficult to convey in words. I encourage you to see film. I should also note that, in order to ensure continued material presence of the project in Ursus, some of the works created during Draftsmen’s Congress were transferred to the outer fence of the local park Park Hassów, forming a material reminder of the communal activity. The paintings continue to be displayed there to this day. Let me highlight again the most important aspect of the three days: The project’s creative subjects were the inhabitants of Ursus. As project originators, we only created conditions to boost communal creativity. We put up canvas walls for Draftsmen’s Congress, but it was the participants who filled the canvas with artistic content. We provided equipment for recording recollections, but it was the inhabitants of Ursus who filled the carrier with memories. We designed the route of the parade, but it was the enthusiasts of Ursus tractors who took part in it. While working on developing the activities to be conducted in Ursus we noticed that 1) Ursus was undergoing dynamic changes caused by the ownership and urban planning transformations of the area of the former Ursus tractor factory? 2) Inhabitants of Ursus (former employees of the factory as well as newcomers) were keenly interested in the history and the future of the place but were not involved in decisions concerning the future of their district? 3) This was largely due to the fact that the local community was fragmented, made up of groups that failed to communicate with one another and differed in terms of generation and origin, lacking a shared identity due to the literal lack of common ground for interaction caused by the long-term neglect of the post-industrial area. The conclusions developed in cooperation with the inhabitants of Ursus led to the project Factory. Ursus 2014 delivered in June 2014. The events included Draftsmen’s Congress – a project originated by Pawe? Althamer, Spoken Memoirs – an installation by Ja?mina Wójcik, Tractor Parade from Plac Defilad to Ursus with the accompaniment of Ziemia Mazowiecka Brass Band, film screenings and workshops. The events took place on the premises of Energetyka Ursus (power and heat plant) the very heart of the former Ursus factory. The main idea behind the project Factory. Ursus 2014 was to invite the inhabitants of Ursus, Warsaw and surrounding towns to the premises of the former Ursus Factory, bring the memories of Ursus Factory back to the collective memory, integrate people around the history of the district, the future of the area of former Ursus Factory. For the curators, the crucial outcome was hearing the voice of the local community and deciding together what artistic-social initiatives should take place in Ursus in the future. Approach the artistic practice primarily as establishing platforms for free individual and collective expression, providing tools for nurturing such expression. This approach makes the artist focus on diagnosing the needs and expectations of the individuals or communities with and for which they work. This exploration leads to proposing solutions that serve as a sounding board for the needs and expectations of the individuals and communities, rendering art one of the channels for social articulation. Know how to use the instruments for constituting communities, provide space for individual beliefs and expectations to interact, engage in a dialogue, transform and model a shared voice. It should be remembered however, that community processes have their own dynamics – moments when groups consolidate and when they scatter, times of conflict and consensus. Artistic practices should accommodate all aspects of the community processes, work through all of them. – While conducting artistic activities, remaining open, interested, patient and trusting. In my opinion, the activities conducted in Ursus in 2013-2014 succeeded in achieving the first two first characteristics of democratic turn”, as described by Cristina Flesher Fominaya. They were designed to drive free expression of individuals and groups (a necessary condition for forming a healthy community) and integration – developing a community sensitive to individuals’ needs and expectations. I believe that, by executing the program outlined in the article Culture for Democracy. Central European Perspective, we succeeded in establishing a platform, framework for individual and collective articulation of needs and expectations and ensuring they are heard. We also initiated collective processes towards merging individual components into a community that is sensitive to the needs of the individual. What about the third element of the ‘democratic turn’ – grass-roots agency, transforming expectations into facts? This aspect can only be approached when the bonds have been created – cementing the collective subject or local community whose many voices have merged into one, capable of speaking for all its members. It is only then that the community is ready for the empowering step from participation and agency to decision-making in the shaping of their reality. This became our focus after the Factory, Ursus 2014 project was completed. Wójcik, J. (2015) Ursus znaczy nied?wied?, Stowarzyszenie im. Stanis?awa Brzozowskiego, M. st. Warszawa, Instytut Studiów Zaawansowanych, Warsaw, available on http://bit.ly/1T47yuC [as of: 10 May 2016].